Industry’s first Electronic Cigarette using SNAPS® Patented Magnetic Activation and Screwless Design. Using innovative SNAPS® E-PACK technology EPUFFER once again takes Electronic Cigarettes to a whole new level. 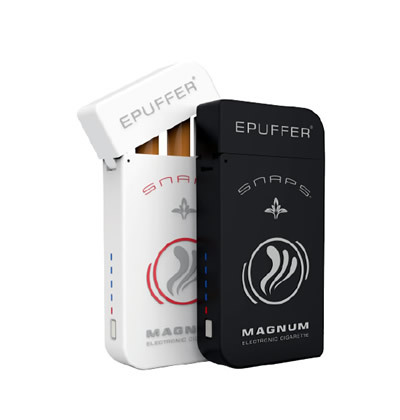 The Magnum SNAPS® E-PACK boasts innovative technology in two separate forms, the Electronic Cigarette and a pocket friendly Personal Charging Case. The battery charging case mirrors the design of a standard cigarette pack, but offers sleek durability to protect the MAGNUM SNAPS® secured inside. An emergency flashlight is located on the case’s exterior as a feature to aid any dimly lit situation. Packaged in a sleek eye-catching box the MAGNUM SNAPS® breathes an air of sophistication from the outset, as it displays the quality of the product at a glance. Opening up the package, users will see that they are presented with everything they need to begin their smoke-free lifestyle in seconds. Available in two nicotine densities and nicotine free. When air flows through the device it is detected by a tiny microprocessor. This activates the atomizer which dispenses miniscule droplets of liquid into the air flow. A secret combination of propylene or vegetable glycerine is added to increase the resemblance to real smoke. 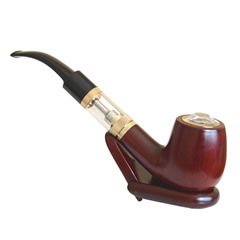 This quickly evaporates into a vapor and smokers inhale the most life like alternative to cigarette smoke on the market. Alternative ways to give up smoking or to choose a smoke-free lifestyle are of course effective however smokers tend to return to cigarettes as they miss the habit of smoking along with the nicotine. The brain associates inhaling smoke with the calming and stress relieving properties of nicotine and so when the smoking experience is taken away, smokers must retrain their brain and make significant changes to their lifestyle in order to maximise willpower. These changes include being active after meals, taking up a hobby that uses the hands or meditation techniques, many also find that they replace this hand to mouth habit with food, which in turn causes the weight increase many new non-smokers complain of. EPUFFER doesn’t claim to be the only solution for those looking to cut down or give up smoking but it does deliver everything a smoker needs to choose a smoke-free lifestyle. For instance, it delivers varying strengths of nicotine to enable users to wean off gradually while mirroring a cigarette without delivering toxic tar and chemicals to the lungs. The EPUFFER don’t smell so there is no longer a lingering odour on clothes. With the elimination of smoke and tar, premature aging decreases, and skin becomes clearer. Gums are healthier and teeth can return to a natural white not stained by smoke from a real cigarette. 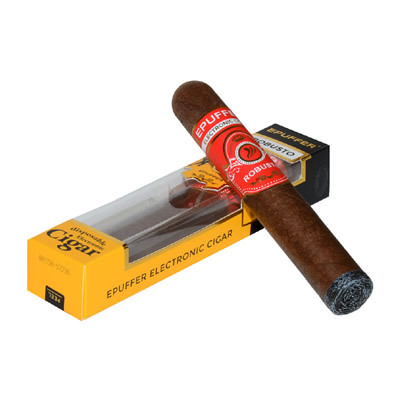 As new EPUFFER MAGNUM SNAPS® is so easier to “SNAP” together there is no stress, as taking one out of the E-PACK PCC takes less than dispensing a real cigarette and so nicotine cravings can be combatted in seconds. Why are we switching to percentage based nicotine labelling? Why? Because vaping industry has evolved over the years and vapers are now more experienced and informed as far as mg/ml, %, nicotine dosage / labeling is concerned. We also must comply with the FDA / EU and UK TPD regulatory requirements. How is the nicotine content measured? Nicotine content in an e-liquid is measured in mg/ml, which is often expressed as a percentage. For instance, a 1.2% nicotine e-liquid will contain 12mg of nicotine per millilitre. Nicotine content increases with percentage and hence the lower the percentage, the lower the nicotine content and vice-versa. Have used Magnum for a few years. This past year I have had to continually buy new packs as the charging mechanism or magnet in the smokes has gotten weak . Not sure what had changed in the manufacture process but it is most frustrating. I will have to look elsewhere for a cigarette type product. I have loyally used this product for four years without having a 'real' cigarette. Dear Marcy, one of our Customer Service agents will contact you to resolve this problem. Got my kit, filled the blanks as per the directions with Canadian tobacco flavour. I charged for hours. Not getting any smoke/vape. Am I doing something wrong? Dear Andrew, please contact our Support Team at 1-855-378-3337 and we will be happy to assist. After Green Smoke went belly up, I started looking for alternative ecig company and very happy that I have found ePuffer. The magnum snaps ecig design and quality is much better and I love their multiple tobacco flavors. My personal preference: Premium Tobacco, Lux and Robusto. 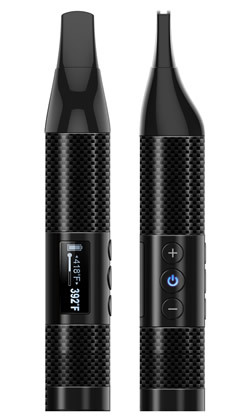 The magnetic connection makes it very easy to use, Plug and Vape! I was looking to upgrade to a smaller mod for work and to carry around, it was on sale so pulled the trigger. All I can say is it's a great little mod. I was surprised on how small it actually is for taking two 18650. This product looks to be an amazing cig-a-like. Very impressed with the new provisions. Would you Guys be willing to send me one of these starter kits to review on my Youtube channel? I'd be happy to post the video after I receive the item. A lot of smokers out there can'd do the whole PV(mods) thing. I understand that. I'm one of them. There is an alternate way to smoke now. It can still be convenient and this is important. Lots of potential customers are turned away every day by this fact. I can show them with this product how easy that can be. I offered this to Joytech on their Eroll E cig. Unfortunately they discontinued it. After trying GreenSmoke, then V2...I decided to test Epuffer Magnum. Hi Mario, thanks for your valuable feedback. Please contact our customer service and we will fix this issue for you. Just to let you know, both batteries needs to be fully charged before operation. Not a review - a question! I would like to purchase this product but would like a black case, tan blank tips, and a white battery/body. Is this possible? The images show conflicting colors. Thank you! Hi Dani, you can request required changes at the time you place your order. Just send us a note and we will take care of it. In general, I like the concept of ePuffer. If you are a pack a day smoker - I would recommend ordering at least 2 extra batteries and the USB charger adapter. These batteries do not last very long. And the package that comes in the kit to charge and hold a cig - can only charge 1 battery at a time. I would also recommend the empty cartridges that you can fill with your own e juice. For me the nicotine level is way to low. So I am filling the empty cartridges with a higher content e juice I buy locally. Over all a good product - but needs some tweaking for heavy, long time smokers. I have used a lot of cigalikes. I just received my kit and I have to say I am impressed . Very nice solid construction . Elegant look and feel . And flavor? The best I have ever tasted and so far that is just with Pemium, Cassis, Menthol and Midnight Pleasure. I have vaped for 3 and 1/2 years. I wish this had been my first kit then I would not have had to keep looking . I have a good idea it will be my last . Looking forward to a long relationship with this company .